The Stress Team floats over the city, locating stressed out people and transforming them into monsters. To combat this, three girls reluctantly transform into the Sweet Valerians, bunny defenders of justice. "Release serotonin! Overflow Dopamine! Glug Glug Glug! Relaxation Squad Valerian has arrived!" Sweet Valerian is a bright, cutsey show very reminiscent of powerpuff girls. 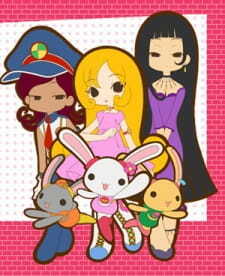 The art is adorable with everyone being chibified and the main heroines transforming into super rabbits. The action scenes aren't that complex though. I gave it a high score because I really liked the character designs and the few instances of weirdly drawn characters thrown in. The music matches the show, with appropriately cheerful and upbeat tunes. The main drawback of the show is that each episode is only three minutes long. The story for a majority of the episodes are "person gets turned into a monster by the stress squad, Valerians defeated it." The characters are pretty one note, even though we get at least one episode dedicated to learning about them. These character's read emotionally flat as well. Their reactions to things seem muted, and the fact that their mouths are so small make their faces hard to read. A good attempt at making a diverse and interesting team, but lack of development hampers it from being great. Overall, it's an action comedy that delivers on smiles and warm fuzzy feelings. If you have an hour and want to watch a solid kid's shows, then give it a try. The first impressions I had about this anime was going to be a slice of life type (since CLAMP love doing those along with romances) with some extremely basic themes as the art design seemed really simple, cute, and heartwarming. With only 18 episodes (plus 8 specials), I’d figure this wouldn’t take me very long to finish anyway. “Sweet Valerian” is really cute and it’s really simple. The entire length of an episode is actually three minutes long, enough time for things to happen and the Valariens to take down the monster but if there is a plot to have it’s simply about this: monsters are created by a super stress gun that detects the highest amount of stress and the Valerians use their powers to find a way to destress, or rather, relax the victim. There is an origin story – the girls were going about their daily lives but realized that life would be a lot easier if they had a moped. So one passes them by and they were each inspired to go get a moped license when they get stopped by a mysterious looking custodian (who’s really Panda-bu, the sidekick and the one who lets the girls know when there’s danger in the city called Asianland City). Soon, they’re led in a secret room where they meet someone called the Ear Hermit. After some training, the girls eventually get something “Valerian License” which is what transforms them into cute, adorable bunnies. All of that, in three minutes, no less! The art is really simple and cute but the animation isn’t very impressive, it’s pretty average. The music in the anime itself is very relaxing and fits with the theme with the story – which is about relaxing even thought here’s so much stress in people’s lives. All in all, it says exactly what’s on the tin box, especially within the three minute time-span; but despite all the mediocrity of this anime, and the extremely simple plot and the time span, the comedy in the series isn’t bad at all. Sure, there’s a lot of cultural jokes that may fly over especially western viewers’ heads but the other jokes are actually pretty funny. The monsters have creative designs and even though Kanoko always tries to talk to them at first, she always loses her temper immediately. Would this series be better as a regular 23-24 minute episode series? Maybe not. The whole idea of this show is to relax and not let everyday stress build up with something charming and sweet. If there’s anything to compare this to, “Sweet Valerian” is like a snack: it’s good to sit down and enjoy it, but if you eat too much, you’ll spoil your dinner.